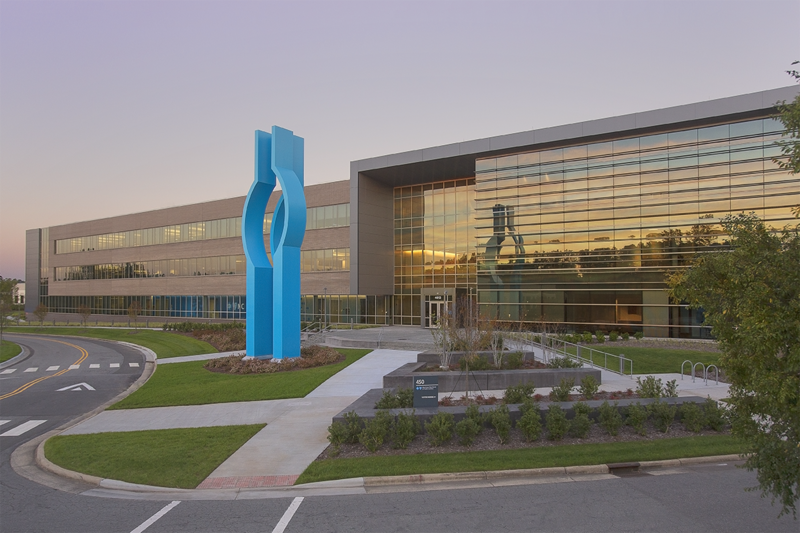 Blue Cross and Blue Shield of North Carolina headquarters in Durham. Blue Cross and Blue Shield of North Carolina announced Tuesday it would lower premiums for the plans it offers on the ACA exchanges by 4.1 percent, on average. This marks the first ever year-over-year premium rate decrease by BCBSNC. However, company CEO Dr. Patrick Conway said that premiums could have been even lower. "We're moving in the right direction, but even with a lower rate, premiums are still too high – particularly for those who don't get a subsidy," Conway said in a statement. "With more certainty from Washington, rates would be 15 percent or more lower. We must address both market instability and the rising price of health care." About a year ago, the Trump Administration ended the Affordable Care Act's cost-sharing reduction payments designed to help low-income Americans get health care. Last year, Blue Cross blamed a significant chunk of its premium increase for 2018 plans on the loss of the CSR payments. While rates won't increase again for 2019 plans, the loss of those CSR payments is already baked in to the premium, which is partly why Conway said the premium cut could have been higher this year. To avoid even higher premium increases, insurers – including BCBSNC – performed a bit of a trick. The N.C. Justice Center, which has long advocated for the ACA, analyzed the market reaction to the loss of the CSR payments. It determined that instead of spreading premiums across all ACA insurance plans, it focused them most heavily in the Silver plans, something the Justice Center dubbed "Silver Loading." Although it stopped funding CSR payments, the Trump Administration left premium subsidies untouched. By loading the premium increases on silver plans, insurers essentially recouped the CSR payments through premium tax credits. 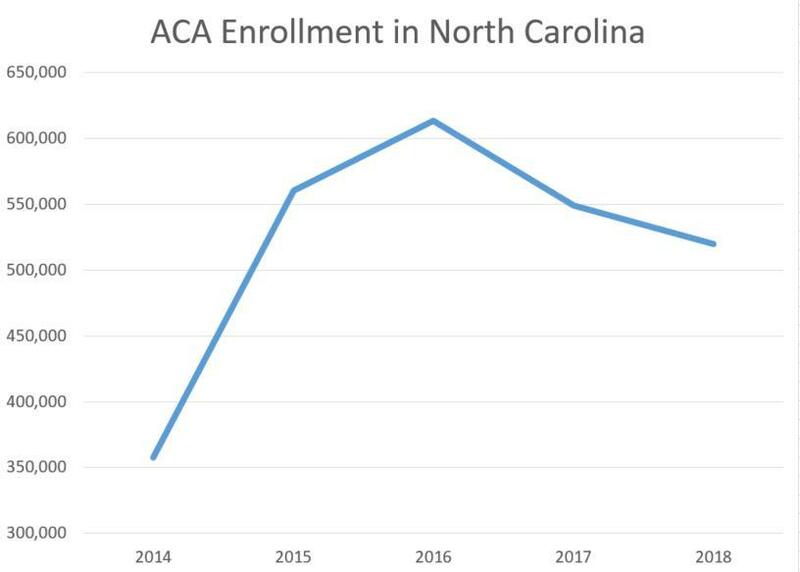 Under the Trump Administration, ACA enrollment in North Carolina has dipped to 520,000, even as it has risen in the country as a whole. It's important to note, that only a small percentage of people buy ACA plans, according to data from the Kaiser Family Foundation. Close to 4.6 million North Carolinians buy health insurance through their employer and 3.3 million people in North Carolina are covered by Medicare or Medicaid, the federally supported health insurance programs for the elderly and poor, respectively. Affordable Care Act enrollment in North Carolina has dropped. Critics have said enrollment levels have suffered because of funding cuts. In early July, CMS announced steep funding cuts for sign-up assistance through state-based programs called "navigators." Financing for the 2019 enrollment season is being cut to $10 million from $36 million. The program was also cut last year. 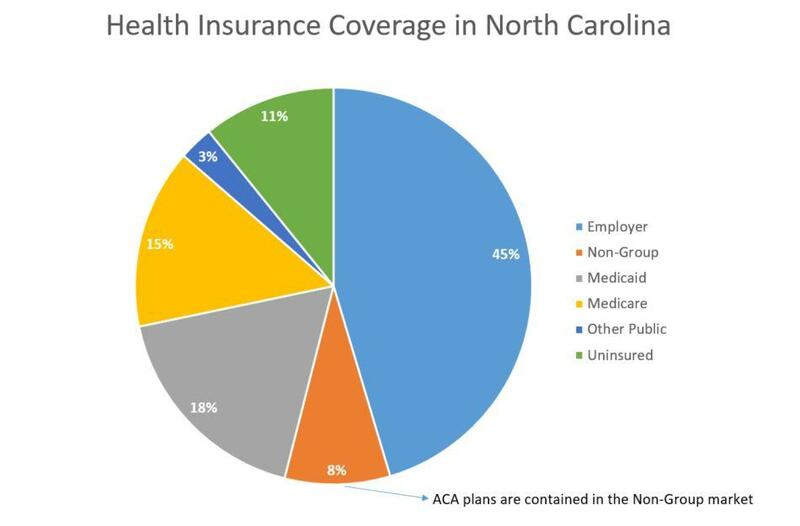 Breakdown of health insurance coverage in North Carolina. BCBSNC has been the only health insurer to offer ACA plans in all of North Carolina's 100 counties. The insurer reported ACA losses of $450 million in the first three years and raised rates on ACA customers every year. Actuaries with the company said the losses and subsequent rate increases were due to a misjudgment of enrollment. The insurer expected enrollees, on average, to be younger and healthier. Those who enrolled in ACA plans filed for more claims than projected, which accounted for the financial losses in that subset of BCBSNC customers.